DC Motor – 200RPM – 12Volts geared motors are generally a simple DC motor with a gearbox attached to it. This can be used in all-terrain robots and variety of robotic applications. 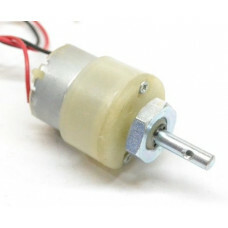 These motors have a 3 mm threaded drill hole in the middle of the shaft thus making it simple to connect it to the wheels or any other mechanical assembly. 200 RPM 12V DC geared motors widely use for robotics applications. Very easy to use and available in standard size. Also, you don’t have to spend a lot of money to control motors with an Arduino or compatible board. The most popular L298N H-bridge module with onboard voltage regulator motor driver can be used with this motor that has a voltage of between 5 and 35V DC or you can choose the most precise motor diver module from the wide range available in our Motor divers category as per your specific requirements. Nut and threads on the shaft to easily connect and internally threaded shaft for easily connecting it to the wheel.DC Geared motors with robust metal gearbox for heavy-duty applications, available in the wide RPM range and ideally suited for robotics and industrial applications.Very easy to use and available in standard size. Nut and threads on the shaft to easily connect and internally threaded shaft for easily connecting it to the wheel. Load current = 300 mA(Max).